Marion loves hats, but as good Libra, have a tough time choosing them. Right now, her problem is to choose one for a costume party. Yes! She first chooses the hat and then the clothes that fit them. If you were her, which hat would you choose? This is my contribution for this week Three Muses challenge. All Hepburn photos at Doctor Macro. 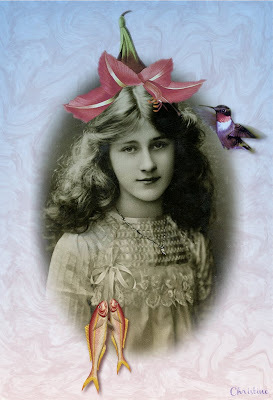 This is Phyllis, a collage a la Suzanne Sbarge for Digitalmania. As she has a flower-hat, I think she qualifies for the challenge too. Ah! Don't forget you can leave your hat on! Both of your pieces are excellent especially the second one, love her flower headgear, Christine! Great take on the theme! Well done! These are fun hat creations - love them both!!! I don't want to choose one, I want them all....and I want to look just like that when I wear them!! (I'm glad Phyllis got to show off her headwear too!). Nice work! Wow Chris what an assortment of awesome hats...I want the second one from the left on the top row...simply gorgeous my dear!!! Audrey sure knew how to wear a hat, that's for sure. Love the second piece what a sweet hat idea. Beautiful Audrey looked great in hats. The second one is fantastic, Christine--love the little fish! No one could wear a hat better than Audrey! But I love the flower hat, too, especially with a couple of fish to dress up the ensemble. Phyllis looks lovely in her flower hat! I like your array of hats. Audrey was a great hat-wearer. I like the center-right one myself. The others would probably not do on me. Very clever take on the theme, Christine! 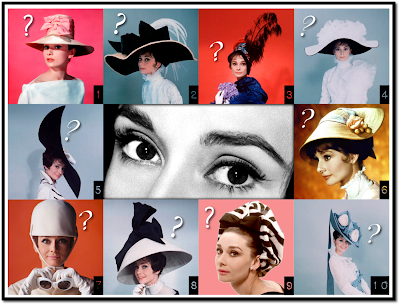 Audrey could wear any hat and look amazing! Nicely done! I come back yesterday I can't let you message. I choose the first one with no hesitation!! Hat number two is the one for me, Christine, and your Digitalmania piece certainly does qualify too.